It wouldn’t be the holiday season if we didn’t trot out our perfect holiday playlist. Guaranteed to get you in the spirit, no matter the task! Press play! Go ahead… we’ll wait. Now that the music’s going… Y’all know we love this time of year. And man have we talked about it over the years. En length. There are so many good ideas and helpful hints within our back catalog that we just wanted to make sure everyone was on the same page. Literally! So, we’ve put together a comprehensive guide to all things Fun Things… for the Holidays! From making ornaments, to taking care of them, we’ve got a little something for everyone looking to deck (but also UNdeck) the halls this time of the year. 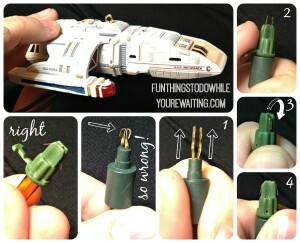 Electric Light Ornament Repair: Leigh breaks down how to repair an old school Star Trek: The Next Generation Hallmark Light and Sound ornament. Plus there is a great earth-friendly tree skirt suggestion. Salt Dough Ornaments: Although this post is for Easter, Coralie shows that this craft is applicable for ALL seasonal ornamentation. 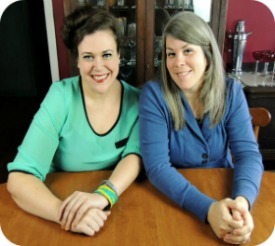 Pinecone Ornaments: Inspired by a talk-show demo, Coralie makes some precious ornaments. 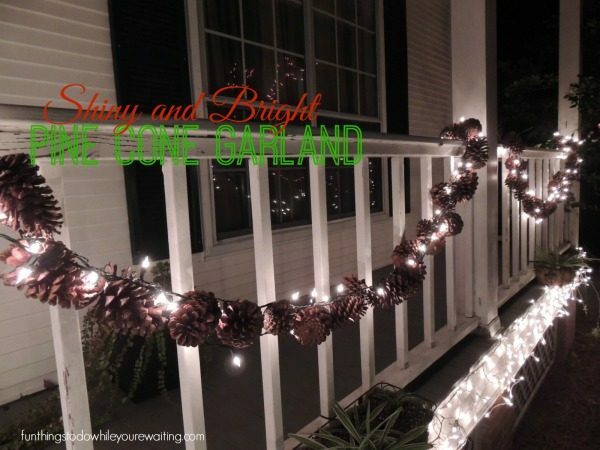 Merry and Bright- Pine Cone Garland: Coralie has swag for days- pine cone garland swag that is. Simple Centerpiece: So simple. So elegant. So yummy smelling. Coralie shares an easy centerpiece idea! Christmas De-Cluttering, Take One: And she then how she breaks down her Christmas decorating game. Take your holiday season game to the next level with these lifehacking, time-saving hints. You might go pro with these wrapping tips. Six Actual Helpful Holiday Hints: Leigh got tired of useless listicles about holiday hints and created a list full of ACTUAL HELPFUL hints for our readers. Gift Wrapping 101: Coralie gives a primer course on gift wrapping. A Gift Wrapping Lifehack: Leigh shares the ultimate trick to have in your gift wrapping arsenal. Never fear oddly shaped gifts again. Oddly shaped gifts will now fear you! We talked about these a little last week, but here is our list of thoughtful gift ideas and delicious recipes that serve as a gift themselves! Black Friday and the Full on Homemade Christmas: In which Leigh tells of the epic adventure of venturing on the Ventura highway at 4:30 a.m. to battle the hoards. 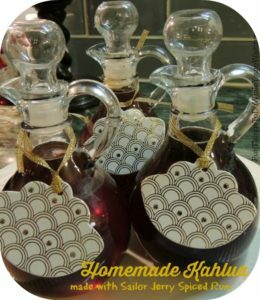 Homemade Kahlua Made With Sailor Jerry Spiced Rum: Coralie put together a thoughtful and delicious gift for friends, family, and neighbors (seen right). Painted Animal Glass Jars: Leigh made these precious painted animal glass jars that were a holiday gift giving hit and reused an everyday item! The Best Cheesecake and Pecan Pie: Based on her Moma’s recipe, Coralie shares with us how to make the perfect Cheesecake and Pecan Pie that are good enough to give as gifts. Bacon-Bourbon Jam: Another installment of ‘awesome things Coralie has made for her friends, family, and neighbors’. DIY Star Costume for Baby Bub: Coralie made a holiday costume for Baby Bubs in a flash! Or if you prefer to hear us wax eloquently on the season, we’ve got you covered. Dashing Through the Snow! It’s My Favorite Time of Year: Coralie explains why this time of the year is the craziest… and she wouldn’t have it any other way. 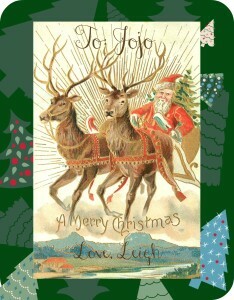 Family Traditions: Leigh shares her thoughts on Christmas and the lead up to the new year. The Whirlwind: An apologetic placeholder post turns into some pretty deep thinking for Leigh. A Recap of Our Family Outing to Tupelo, MS.: Coralie shares her families trip over the holidays to see family friends in Tupelo. 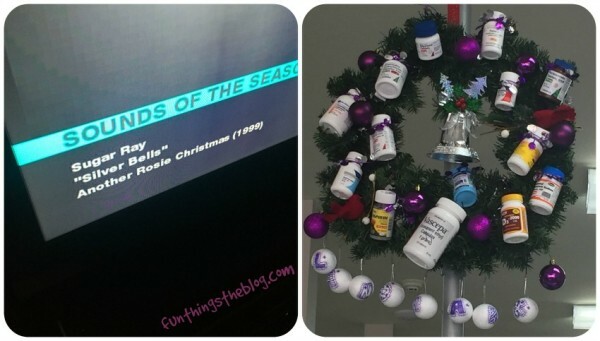 Fun Fotos: Holidaze Edition: Leigh shares funny photos she collected over her holiday season. We love sharing our holiday bag of tricks with you guys and look forward to adding to this list as the years go by. What do you think? Is there something you’d missed the first time around? Do you know the trick to wrapping an oddly shaped item? 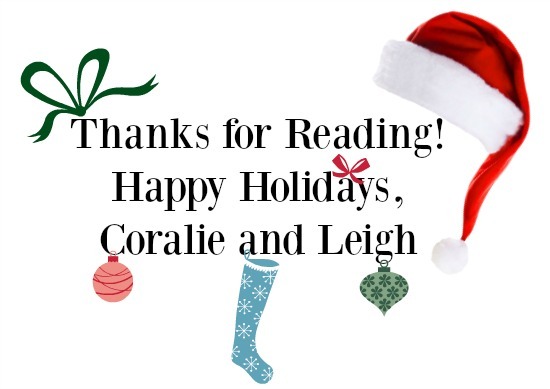 Let us know if you’ve been naughty or nice in the comments!